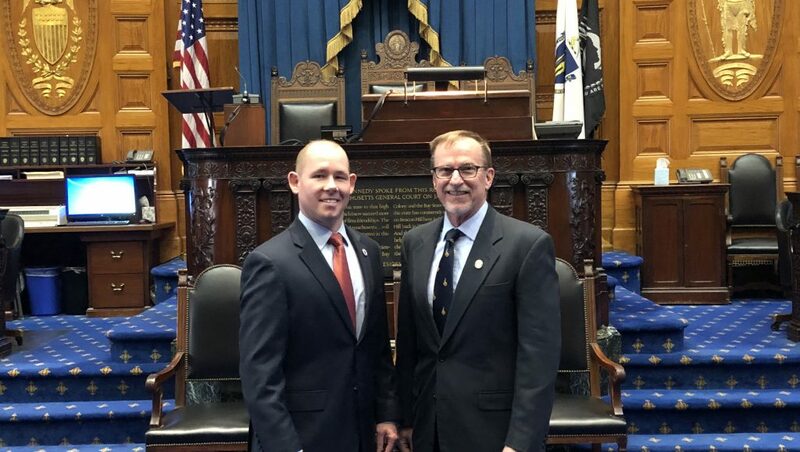 Representative Richard M. Haggerty (D-Woburn) recently welcomed Reading Veterans’ Services Officer Kevin Bohmiller to the State House for the 2019 legislative luncheon hosted by the Massachusetts Veterans’ Service Officers Association (MVSOA). This annual event honors the state’s Veterans’ Service Officers for their work and advocacy on behalf of our Commonwealth’s veterans and their families. After the event Rep. Haggerty took Kevin Bohmiller on a tour through the historic State House, visiting the House and Senate Chambers along with the Hall of Flags. The MVSOA luncheon is an annual event that draws bipartisan support each year. Governor Charlie Baker, Senate President Karen Spilka, and House Speaker Robert DeLeo addressed the crowd, along with the many other elected officials and speakers. The organization leads in championing legislative agenda for veterans, supporting those who have served and their loved ones.